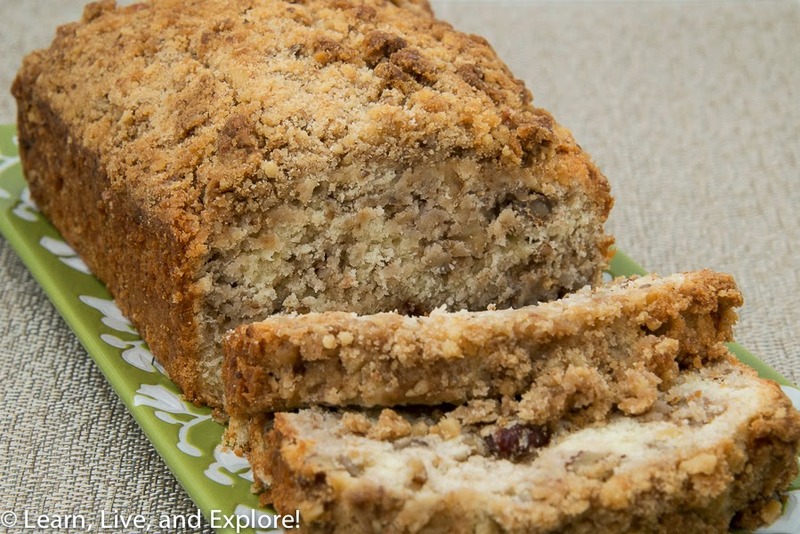 Apple Pie Bread ~ Learn, Live, and Explore! Oh, yes, it's APPLE SEASON! More specifically, it's sweet and juicy honeycrisp apple season. I bought about a dozen giant apples at Costco this week, so I've been searching for ways to incorporate them in new baked goods. Perhaps you spotted my Appledoodles the other day? 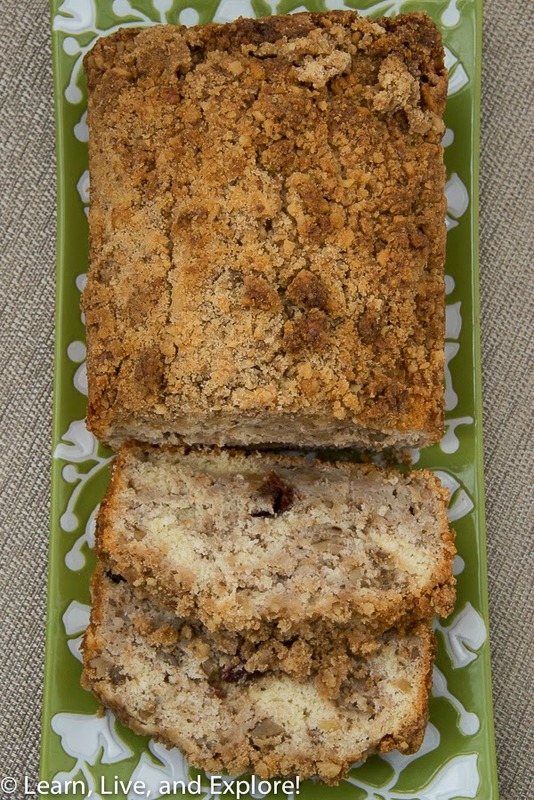 Next up is this apple pie bread I found from blogger Cookies & Cups. I skipped the optional biskoff cookie crumbles and glaze, keeping it simple. Though, I'm not opposed to trying this recipe again with the alternative preparation in the near future. A couple of things I noticed after the bread was sliced. First, it's a very dense bread, so don't be surprised. Second, I think I should have somehow removed some of the moisture from the grated apples, perhaps by patting it with paper towels. The grating process of the honeycrisp apples generated a lot of liquid heavy shreds, and that probably contributed to an observed longer baking time and denser bread. Finally, I am actually curious if it would taste better without the dried fruit, and even the walnuts. Try it yourself, and tell me what you think! Preheat oven to 350 degrees F. Grease the bottom and 1/2 inch up the sides of a 9x5x3-inch loaf pan; set aside. In an electric mixer, beat butter on medium to high speed for 30 seconds. Beat in sugar until combined. Add buttermilk and baking powder, beat until combined. Add flour and salt, beat until combined. Stir in apple, nuts, and dried cherries (or raisins). Make streusel topping by combining the ingredients in a small bowl and using a pastry blender to cut the butter until the mixture resembles coarse crumbs. Stir in walnuts. Spoon or pour batter into the prepared pan, spreading evenly. Sprinkle streusel topping over batter. Bake for 60-65 minutes or until an inserted wooden toothpick comes out clean.